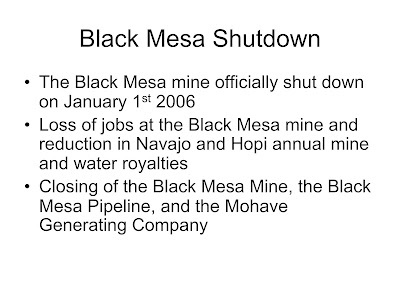 Slide 4: The two mines, Kayenta and Black Mesa, together make up on of the largest strip-mining operations in the US. 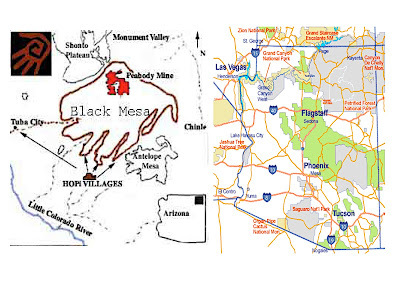 Slide 5: This image shows the Black Mesa pit and mining operation. 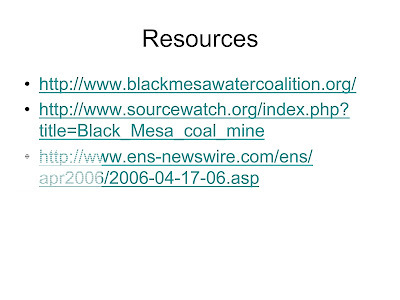 It also shows how the local landscape is destroyed by the mining operations. 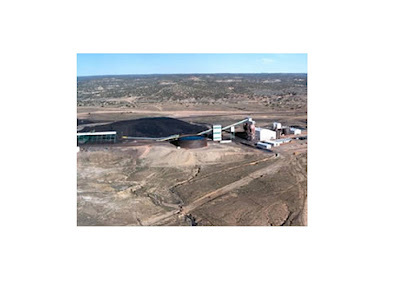 This slurry pipeline was unique in how coal is transported in North America, where other transportation means for coal is by railway. 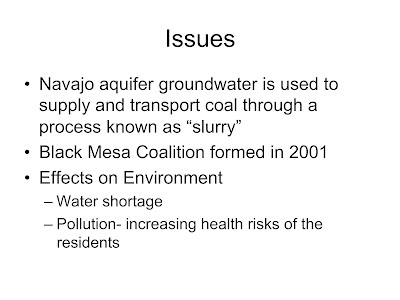 And yet today Navajo and Hopi residents that live on Black Mesa still do not have electricity or running water. 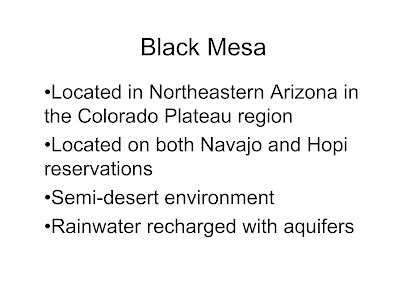 Historically the Hopi have not been consulted regarding decision making for Black Mesa with regards to mining, royalties, and water use. 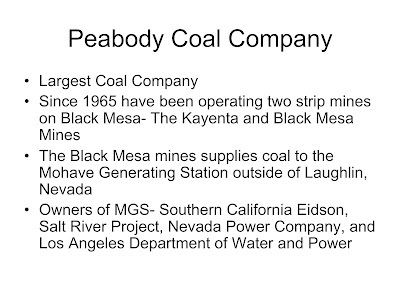 The Navajo and Hopi governments alone have dealt and negotiate with federal agencies and corporations like Peabody. 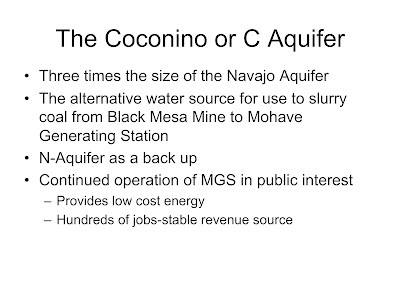 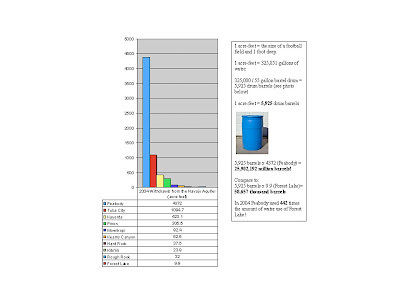 To address the ground water use and depletion of Coal company’s coal-slurry operations, there has been emergence of grassroots groups and organizations such as To Nizhoni Ani and Black Mesa Water Coalition which assumed the role to inform and build awareness within Navajo and Hopi communities to take the leadership in the protection of the Navajo Aquifer. 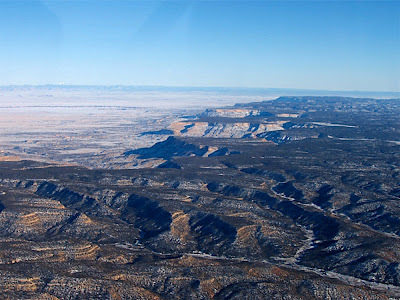 According to the EPA, the coal plant was the dirtiest in the Western U.S., emitting up to 40,000 tons of sulfur dioxide per year. 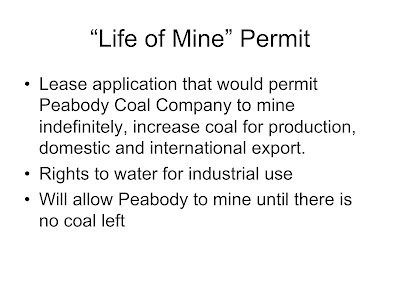 Slide 9: Peabody Coal can still reopen the mine any time they wish because they have a permit that allows them to take both coal and water until there is no coal left.